I recently went back and reviewed a post where we discussed a single blind tasting of what turned out to be Linne Calodo's Outsider Zin blend vs. Rosenblum's Zin. I feel like a certain amount of explanation is in order as it seemed to me that we came off a bit harsh. I recently had a chance to taste a considerable portion of the current releases from Linne Calodo and have to admit that the wines have a beautiful structure, balance, and mouthfeel that would be very appealing to any wine lover. That is not to say the Outsider is not true to our original analysis. Actually, tasting much of their wine reinforces the Outsider's place as well-- an outsider. 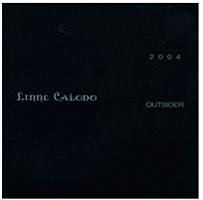 In the pantheon of well made wine that is Linne Calodo, the Outsider seems to be a bit too simple and too fruity in the nose and on the palate. It has, however, an underlying structure that comes closer to befiting its $45 price tag. This was a point I feel was forgotten in our amazement over how simple this wine was otherwise. At its heart this wine is much like Paso Robles, a little lost in its identity but certainly finding its way. And yes, I did retaste the Outsider (at the winery mind you) and I was struck by the same impression as when vino girl and I tasted it the first time with the Rosenblum. It was an oddity among some very impressive wines. Will this wine settle down aromatically and join up with its brethern? I find that hard to believe. Nonetheless, the wine found a sweet spot (no pun intended) with some of the peeps who were able to taste the dregs of vino girl's and my excess. Needless to say this is a good drinker and was deemed very enjoyable -- which just goes to show you that knowing (and being true to) yourself is the key to enjoying wine. It's our job to give you the facts as best we can. It's your job to interepret them with respect to your own palate. And remember-- in the end its just wine. Cheers. I found the wine to be absolutely excellent. It was full bodied and just as smooth as you would like. I've been drinking wines for only about 5 years but I know what I like and I really liked the Linne Calodo" I'm ready to order a few cases from my friend who I'm happy to say owns a fine restaurant and will sell me some.